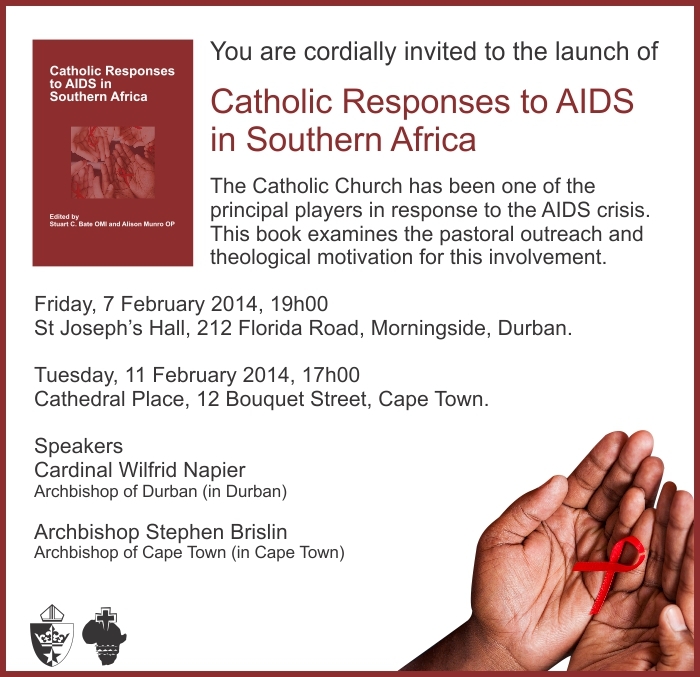 The Catholic Parliamentary Liaison Office and the SACBC Aids Office cordially invite you to join us for the launch of the book Catholic Responses to AIDS in Southern Africa on Tuesday 11th February 2014, at 17.00, at Cathedral Place, 12 Bouquet St, Cape Town. The main speaker will be Archbishop Stephen Brislin. Despite occasional accusations to the contrary, the Catholic Church’s contribution to the effort to overcome AIDS does not focus on the ‘condom question’ – the Church is in fact the largest provider of AIDS-related services and interventions, apart from government itself. Catholic Responses to AIDS in Southern Africa explores the Church’s commitment both pastorally and theologically. Please feel free to circulate the below flyer to your network. RSVP by Friday 7th Feb to Mandisa Dyantyi (mandisa@cplo.org.za) or call 021 461 1417.